(CNN) -- UEFA president Michel Platini has cast fresh doubt over Ukraine's co-hosting of Euro 2012 with Poland after the latest inspections by European football's governing body. 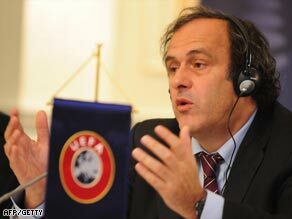 Platini voiced serious concerns about the state of readiness of the Ukrainian cities. UEFA has given the go-ahead to four Polish cities, Gdansk, Poznan, Wroclaw and the capital Warsaw to host matches, but Ukraine continues to cause some concern. The capital city of Kiev has been cleared for group matches, the quarter and semifinals, but not the final on July 1, 2012. Kiev's main stadium was used to host the football final at the 1980 Moscow Olympics. Donetsk, Lviv and Kharkiv have not been confirmed as venues and, like Kiev, have been given until the end of November to meet the requirements around the readiness of stadium and other infrastructure, including transport and accommodation. Dnipropetrovsk and Odessa have been dropped as hosts or reserve cities. "There are numerous infrastructure issues that urgently need to be resolved in Ukraine to convince the UEFA Executive Committee that the host city candidates can be appointed as Euro 2012 host cities," said the Frenchman. Platini added that although progress had been made over the last few months both countries still needed to put in "a huge amount of work." UEFA, who awarded Euro 2012 to the Eastern European countries in April 2007, originally planned for both countries to have four host cities, with two each in reserve. The decision was greeted warmly by fans in both countries, but almost immediately problems surfaced about readiness, particularly in Ukraine. In early 2008, Platini warned about "critical slippages" and rumors circulated that alternative hosts could be put in place with Scotland reported to be interested. The 2012 tournament will be the last with just 16 teams before the finals are expanded to 24 for Euro 2016.